Hospital food has come a long way. Many healthcare facilities have been taking proactive measures toward improving patients’ health and the meal service experience. A facility’s patient satisfaction scores are becoming prominent factors for government programs and Medicare incentives as well as points of differentiation among increased competition. In response to the demand of healthier eating habits more and more hospitals are finding ways to introduce organic produce to their patients and staff. 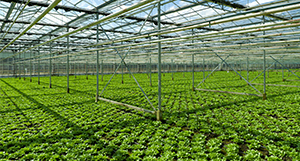 The Henry Ford West Bloomfield Hospital in Michigan was the first hospital to open its million-dollar on-site greenhouse in September 2012. “We grow pretty close to 100 percent of all of the herbs that the kitchen uses,” said Michelle Lutz, resident farmer at Henry Ford West Bloomfield Hospital. All foods prepared in the hospital kitchen come from either the greenhouse or from local sustainable producers. Several other hospitals around the country are taking the same approach with building on-site gardens. 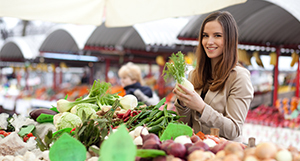 Kaiser Permanente sponsors over 50 hospital-based farmers markets and farm stands in 5 states. The organization devotes about 16% of its overall food spending to sustainable foods and is expected to grow to 20% by the end of the year 2015. Another way to promote healthier eating habits in hospitals is to replace unhealthy offerings with healthier choices. Marine Medical Center in Portland fully redesigned its cafeteria back in 2000 by reducing the dessert bar by 40% and installing salad bars that includes protein rich beans, seeds and tofu. “Fruit sales increased by 500% in the first year after we introduced a fruit cart and upgraded the quality of fruit,” says Director of Food and Nutrition Mary Keysor. The introduction of more organic foods into diets, especially in hospitals, comes with an even greater attention to food safety. From receiving to serving, proper food handling practices along with the proper tools will help minimize any potential danger to the patients’ health. The right products make a difference. Storage containers with proper lids can extend product freshness, vital to organic produce and reduce the risk of cross-contamination. Connect with one of our Healthcare professionals for more information on a wide variety of foodservice solutions for any healthcare facility. Guess That Cambro Product Name!